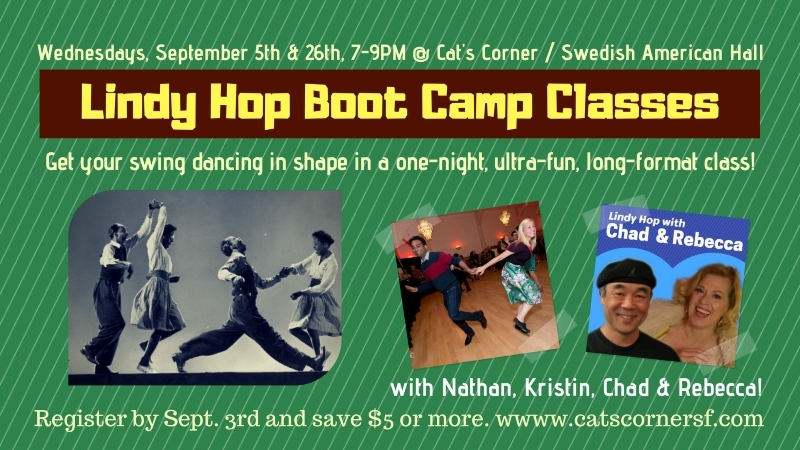 Please read: September 2018 is a Boot Camp / Special Schedule month at Cat’s Corner! Due to private events on a few nights of the month, September 2018 will be a special schedule & boot camp month of classes and dance parties. Don’t worry, we have great dancing options for you the whole month. Costs: 7pm lesson and party – $30. 9pm lesson and party – $10. Costs: 7pm lesson and party – $25. 9pm lesson and party – $10. FREE lesson & party this week. Buy drinks and tip the band and bartender! ← Wed, Aug 29: Tutti Frutti Dress-up & Dance Party with Clint Baker’s Golden Gate Swing Band!